Gangtok: A day after Bhaichung Bhutia, the leader of the day-old Hamro Sikkim Party (HSP), threw a challenge to Sikkim chief minister Pawan Chamling, the ruling Sikkim Democratic Party reciprocated by taking him on at his own game, kick-starting a month-long football tournament in West Sikkim on Friday to consolidate the party's support base in the crucial district which has eight out of the 32 Assembly seats in the state. The tournament for both boys and girls will be held in all the 373 panchayat wards of the district with the finals to be played at Kyongsa Ground in Geyzing on June 30 where Chamling, who is also the SDF president, is expected to be present. The tournament is being organized by the West District Executive Working Committee of the SDF. N. K. Subba, the senior vice-president SDF, West Sikkim and minister for urban development and housing department, said the tournament was being held to promote football in the district. "Yes, the chief minister is expected to attend the finals. We will be inviting all the participating players to the finals, which will be a grand affair," he said. Two teams each from the 373 wards means the tournament will involve 8952 players, if only the playing eleven of each team is counted. However, there are very few takers for Subba's claim that tournament was only about promoting football. Many believe the real reason is political, coming as it does at a time Bhaichung, who is a youth icon in Sikkim, has thrown down the gauntlet at the ruling regime, which has been in power for close to 25 years. "The SDF has never in the past organized a football tournament on such a mass scale. The tournament and the recent announcements of job quota for sportspersons and annual grants to sports clubs are clearly meant to preempt youths from flocking to Bhaichung," said an observer. Apart from announcing the quota and whopping annual grants of Rs 12 lakh each to List A clubs and Rs 6 lakh each to List B clubs, the chief minister in recent weeks have been seen reaching out to footballers from the state in an obvious attempt to negate the Bhaichung effect. It is significant that both Hamro Sikkim Party and SDF have chosen to focus on West Sikkim in the lead up to next year's Assembly elections. The West district has eight Assembly seats and given the vast majority of the population is Subbas, it generally votes en masse for one party. In fact, during the last Assembly elections, West Sikkim and South Sikkim, which also has eight seats, were instrumental in ensuring the fifth consecutive term for the SDF as the party had made a clean sweep of all the 16 seats in the two districts while losing nine out of the 12 seats in East Sikkim and one out of the three seats in North Sikkim to its rival Sikkim Krantikari Morcha. 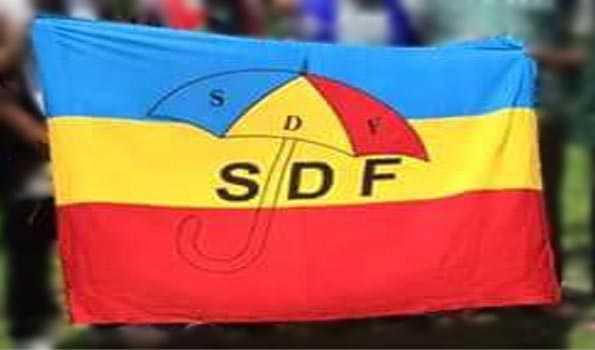 The SDF has hit back at Bhaichung for his comments against the chief minister at the launch of his party in Daramdin on Thursday. "Bhaichung Bhutia has no programme of his own party. Therefore, he is blaming the chief minister without any rhyme or reason. He has not given any reason, and all his allegations are false and fabricated. His political plank is based on the false propaganda that he has started against the chief minister," said Bhim Dahal, the SDF spokesman.